Oh wait, hope you weren’t expecting pictures of a real baby. 🙂 That’s another 12 weeks in the making- though I’m ready for that baby to be here as well! Here’s my special present from a very sweet hubby. I was surprised on Valentine’s Day with the offer to go pick out one of two options at the Bernina store. This little scenario came about with my frustration at the inability of my Singer machine to keep up with the demands of constant sewing- leading to my trying a friend’s Bernina and becoming hooked on how amazing it was! However I had figured this was something I would have to work and wait for another several years. The hubs was so impressed at the quality of the Berninas and how well they keep their resale value that he decided I should go ahead and get one now since I could put it to immediate good use. Just so happened that the local Bernina store was having a great sale and had ordered the special edition which came with an extra free-motion quilting foot at a cute skin. For those inquiring minds, this is a Bernina 350 PE. My actual machine… Isn’t is so pretty? I am loving my new baby…might be neglecting the other baby in the house to play on this thing. 😉 Free motion quilting is a dream on this thing! 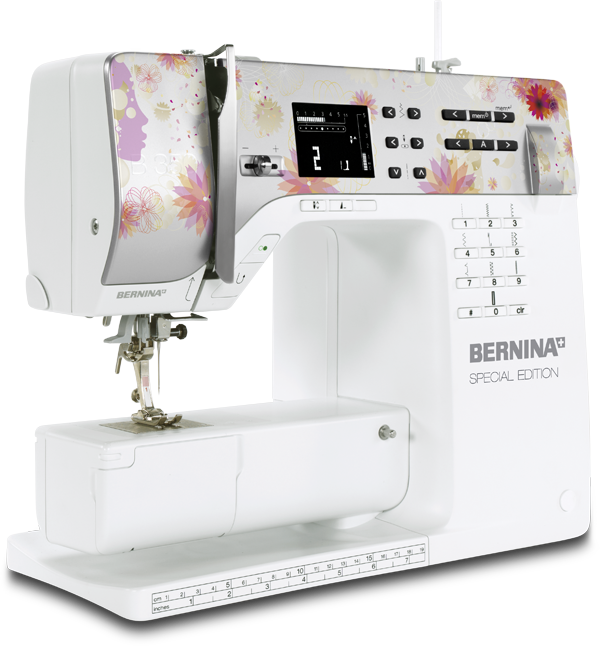 It’s amazing how smooth sewing can be… the Bernina brand definitely lives up to it’s hype. I was waiting a few weeks to write my blog review on this machine because I wanted to try it out for a bit, and I am here to tell you that I am still super happy with it. I don’t know all the ins and out of my machine yet, but my mastery classes begin in April, and I can’t wait to find out all the special things that it can do. Meanwhile I’m having fun learning on my own. I’ve got two quilts to be quilted on the list for next week and can’t wait to see how this baby does with them! And now I have my present for Valentine’s Day, birthday, anniversary, and most likely Christmas. 🙂 One stop shopping for the hubby! This entry was posted in Personal, Selfish Sewing and tagged bernina 350, bernina sewing machine by oliver's fancy. Bookmark the permalink. I just bought the 350 PE, so mine is similar but without the flowers! This is my first Bernina too, and I have been very pleased. What number foot are you using for free motion? Mine did not come with the free motion foot and I haven’t been to the store to buy one yet. The quilting foot it came with is #29. I was really happy to have that little extra added on for the special edition!